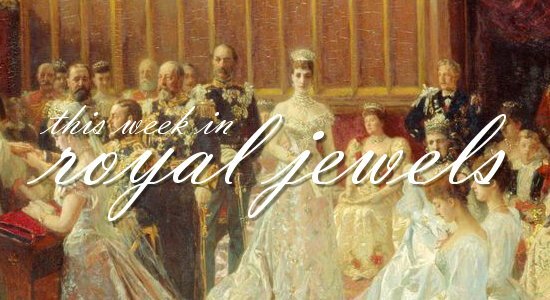 Welcome to a supersized version of our weekly royal jewel roundup! Don't forget to vote for your favorites in the poll below! 20. Princess Deena Aljuhani Abdulaziz of Saudi Arabia chose a trendy diamond ear climber for the Elie Saab show in Paris on Saturday. 19. 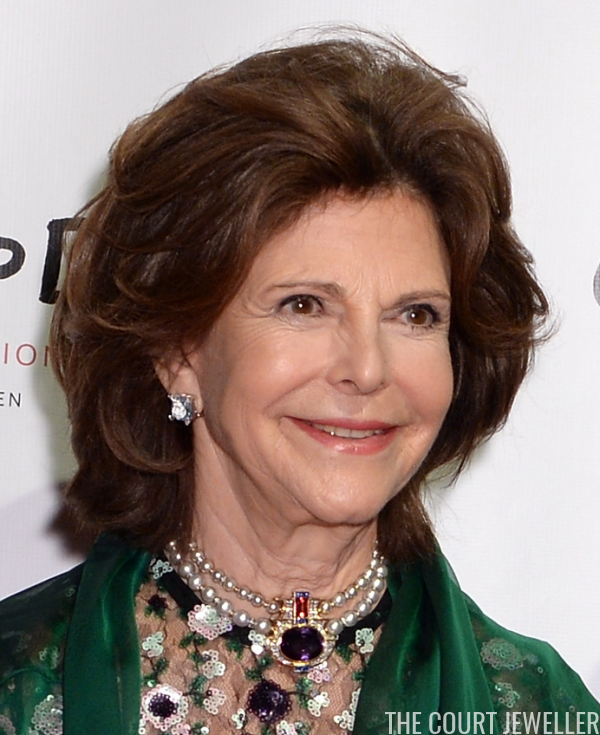 Princess Stephanie of Monaco wore sparkling stud earrings as she visited Romania on Wednesday to dedicate a monument to her late father, Prince Rainier III, at Circus Park in Bucharest. 18. On Friday, the Countess of Wessex wore blue topaz drop earrings and a necklace from Hermes at the Headley Court Farewell Parade in Dorking. 17. 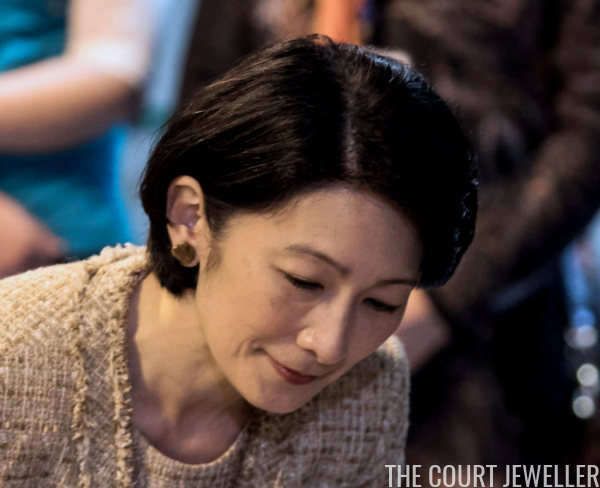 The Akishino visit to Chile continued this week; on Saturday, Princess Kiko wore oversized (yet understated) stud earrings for a visit to an adult rehabilitation center in Puerto Montt. 16. 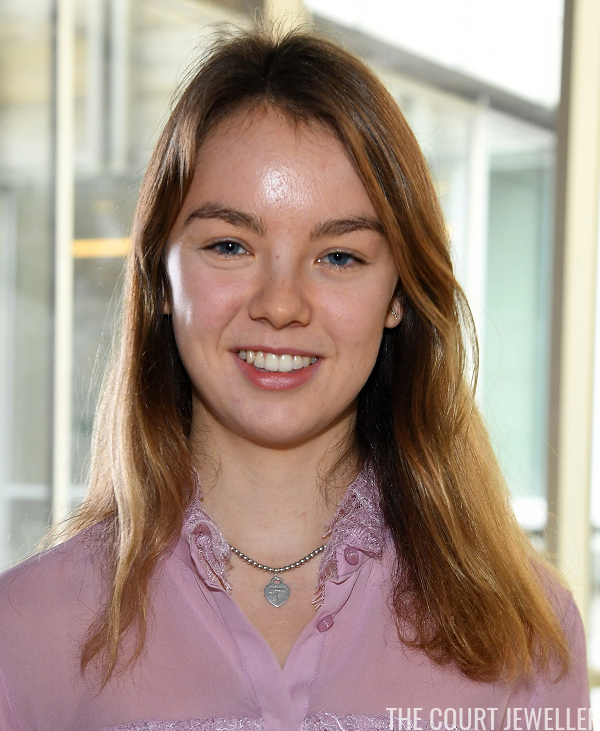 On Monday, Princess Alexandra of Hanover (daughter of Princess Caroline of Monaco) wore a silver necklace with a heart charm -- perhaps Tiffany? -- for the Giambattista Valli show in Paris. 15. Gold earrings and a statement necklace accompanied Princess Laurentien of the Netherlands to an awards ceremony in The Hague on Tuesday. 14. 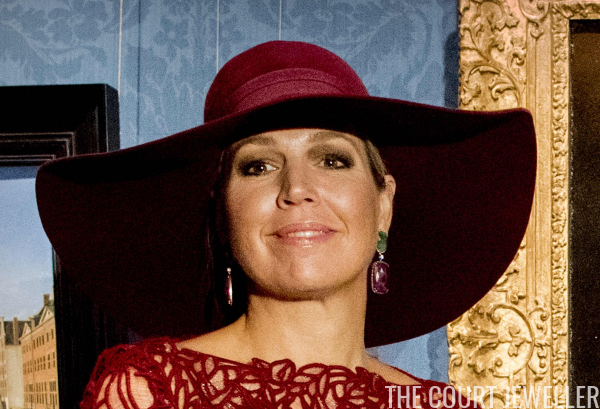 Queen Maxima of the Netherlands made a major statement with yellow earrings on Thursday for a conference on gender and women's health in Amersfoort. 12. Earrings from Ole Lynggaard, plus a floral brooch and glittering bracelets and rings, were Maxima's choice for a lecture at Koppert Cross in Westland on Tuesday. 11. 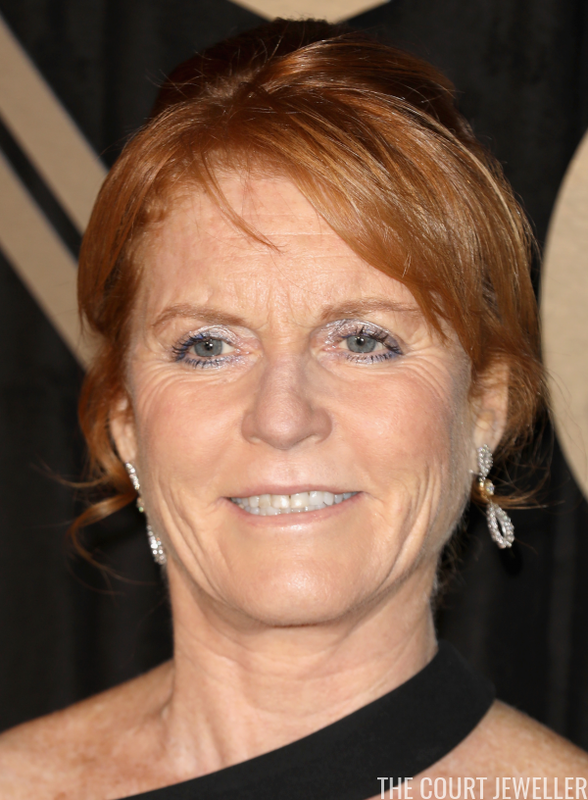 Modern diamond and gold earrings were the jewel of choice for Sarah, Duchess of York at the BFI Luminous Fundraising Gala in London on Tuesday. 10. Princess Sirivannavari, the fashion-mad daughter of the King of Thailand, was still in Paris this week; on Saturday she wore trendy earrings and a stack of bracelets (including two Cartier Love Bracelets) at the Elie Saab show. 9. On Monday, Princess Sirivannavari wore glittering diamond earrings (and a sparkly beauty mark) at the Giambattista Valli show in Paris. 7. Catching up on an event from late last Thursday, Princess Charlene of Monaco wore major diamond stud earrings for the Monte-Carlo Gala for the Global Ocean. 4. At the opening of parliament in Denmark this week, Queen Margrethe II, Crown Princess Mary, and Princess Marie all accessorized with brooches. 3. My favorite jewels from the opening of parliament belonged to Princess Benedikte, who wore a necklace with red and green cabochons. 1. 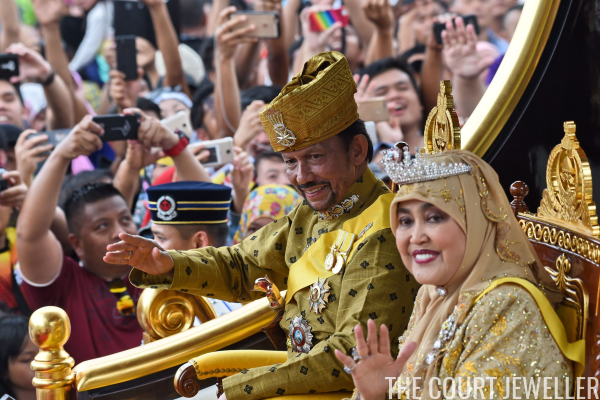 The Sultan of Brunei and Queen Saleha get my joint top vote this week -- I mean, look at the diamonds they were both draped in for Thursday's Golden Jubilee procession!